Hi, it's Darcie again. Thank you so much for joining us on our Ustream show last Saturday! Here is the vintage mask we altered to contain a mini-album. It was so fun sharing childhood memories with you! We also enjoyed the pictures you posted on Twitter of you in your Halloween costumes :-) so cute! I showed you how to make a buckle binding with the WeRMK Euro Hole Power Punch and gaffers tape. It is a strong vinyl-coated fabric tape that can be used similarly to duct tape. I had it on hand and it was black, so there ya go. I came up with three different ways to bind albums with it and I am sure there are many others. The one we made on Saturday was a simple buckle binding using 1" wide rings made out of gaffers tape and Velcro. It is lightweight, versatile and doesn't limit you to the size of the album you want to make. You can use buttons, large brads or the bling I used. It will be pretty either way. If you want to see the complete instructions for the Halloween version, check out our Ustream channel, ScrappyCamperSisters. I also made two more styles for journals, a chipboard-covered one and a simple folded cover. Here are pictures of what I was describing in this video. To make a chipboard cover, make a three part cover and line each piece with the paper of your choice. Tape the pieces together with the gaffers tape after punching the holes in the spine. This is what the cover looks like inside when you are joining the cover pieces. You only place the tape up to the holes in the spine. Tape on both sides. Add the pages and wrap the gaffers tape "rings" through the spine. Isn't it purdy? You can use buttons, brads or bling like I did here. For the folded cover journal below, I used several pieces of 8 1/2" x 11" colored card stock, folded each one in half on the long side and then punched with the Euro Power Punch as in the journal above. To make the cover, I cut a larger piece of card stock so that it was 1/4" wider to cover the pages and scored it down the middle. I then stacked my folded pages and fit them inside the cover. I traced inside the hole on the pages with a pencil to mark the inside of the cover where the punch should go so that it would match the pages. Next, I folded the cover inside out and then punched, following my markings. And here is the finished journal. These are all quick and easy - I hope you will try them! Hello, campy people! This is Darcie, remembering fun times on Halloween. I used to love Halloween as a kid. We always dressed up and went trick-or-treating in the neighborhood. Depending on how many children in the family there were that year, we may have pulled a little one in the wagon, but we always went together. My dad drove us sometimes because it could get cold in New England and I remember wearing leggings under my costume a time or two! I can't find pictures of me in my costumes, but I do have the memories. My favorite costume was one my mom made of a Native American Princess. I was also a ballerina, a witch and a Medieval Princess. I was a lot of princesses - hmmm, go figure! So, as an ode to a more innocent time, not to mention grocery store costumes and those plastic masks that would make your face sweat, I offer you this Vintage Mask Wall Hanging. 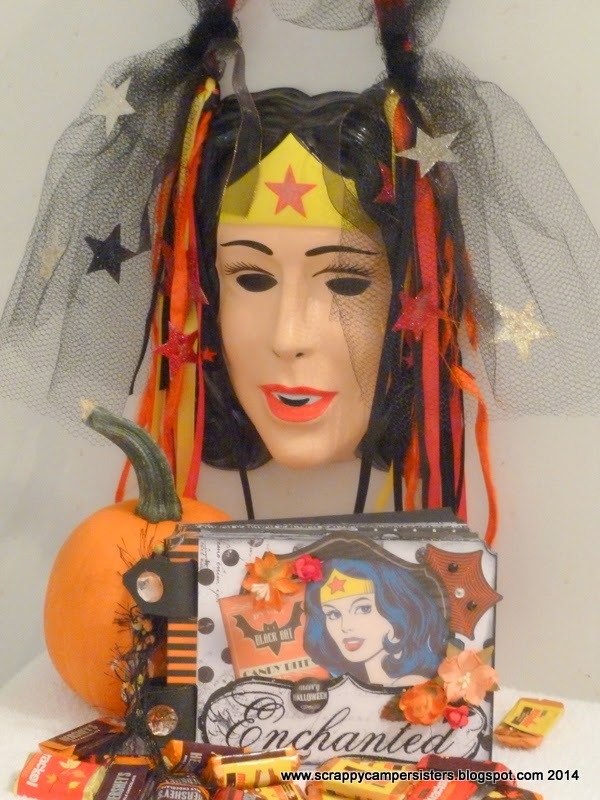 What a fun way to decorate for Halloween and it would make a great gift. The mask is reinforced with paper mache inside and there is a pocket that can hold candy and a mini album. This one is my fave Wonder Woman and we will be making a different one to give away on our show. So, come join the fun when we broadcast on Ustream Saturday, Oct. 4, 2014 at 9 AM EDT. See you there! Hi everyone, it's Darcie again. 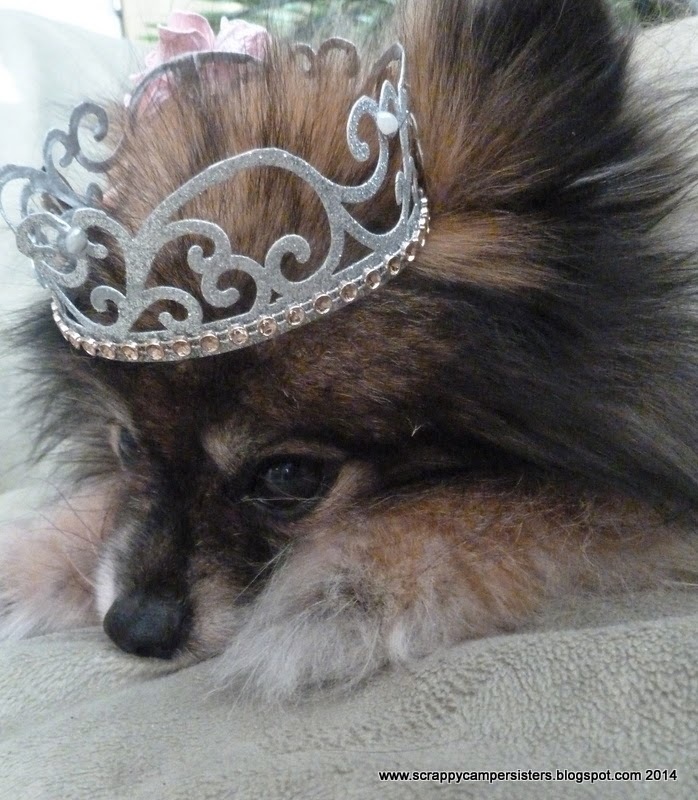 I promised you pictures of Gabby in her tiara, since I made her one too. The tiara is made with the EK Success Scroll Pattern punch and some glitter cardstock. A little bling, a flower and some ribbon in the back and voila! I think she likes it! Hmmm, so far so good. This is going better than the usual photo shoots when Gabby gets dressed up. Oh, here it comes..... the sulking pose as my model gets tired of the fanfare. I knew it was too good to be true! 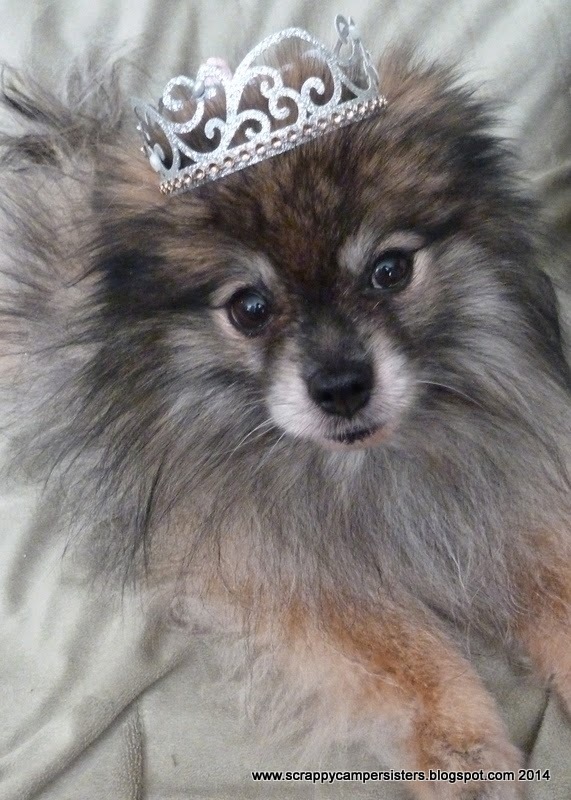 Off comes the tiara, we don't want a sad little princess, do we? Time for treats! Hi, it's Darcie here, thanking you for joining us bright and early on National Scrapbooking Day! This is the project we worked on, a sparkly tiara set on a pillow with a mini album inside. The tiara is made with the Martha Stewart Fans and Flourishes die and glitter card stock, and of course lots of bling. It makes a great gift and can store memories of a child, a pet or hey, make one for Mom! The pictures are of the C'est La Vie line from Bo Bunny and the line we used on the show was their Primrose collection. Those pictures will be coming soon. The mini has a canvas and ribbon binding and is a nice size for 4x6" photos. If you missed us live, the recordings for making the box are available so we hope you will check them out. The mini album will be recorded soon as we ran out of time. So much to do today and we didn't want to miss any of the other wonderful crafters. We hope you had a great day! Hey Campers! I am posting these pictures from our NYE Streamathon Class. Darcie used Webster's Pages New Year New You, I used the DCWV Vintage Collector and our mom used Mademoiselle line by DCWV. 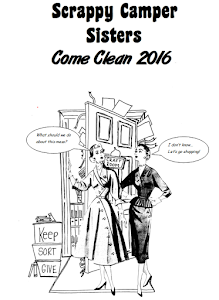 Hope you enjoy our completed projects! And thank you again for joining us for the NYE Streamathon, we look forward to ringing in the new year with you all next year! Off to CHA! Woot!